This show is a chance to find out about what other people in the ID field are doing. We’ll be interviewing people in this area. As the first show, we’re introducing ourselves – background, work and interests. And what ID means for each of us. Post-secondary education settings. Interested in what’s going on at college and university. Lots of emphasis on online teaching in learning. Working with faculty in online teaching and learning. Deals a lot with issues and challenges in the online learning environment. Issues with establishing social and teacher presence to make strong relationships online soon – so people feel safe; doing bio activities. Do a weekly professional support group for faculty. Formerly faculty member at university of Ed at U South Dakota. Now at University of Montana. Doing practical side of what used to teach. ID team in continuing education. Support faculty. Interested in creating a professional development support group concept. Trying to create a community of practice in terms of faculty development – that social piece for faculty teaching online. Come from working with college faculty – to create powerful online courses. Now at University of Montana to bring student services online. Forming a top level leadership team to create an audit of where student services is now at. Wondering if any other campuses are doing that kind of effort? Getting PhD (distance learning) – connection of the distance learner to the university environment. Interested in establishing community for distance students. The non-higher ed black sheep of the mix! I’ve been doing “ID” for 15 plus years in the (mostly) corporate sector. Background in ESL – moved into ID about a year ago – with interest in using technology to improve learning experience for students. What does Instructional Design mean to us? ID is in being in service to help learner’s achieve certain goals. “What can I do to create the best possible learning opportunity for students (and myself)?” Ways to create student engagement and creating personal relationships. How do we engage students that lead to their relevant professional development and personal enrichment? Who’s at the center of your work? Creating engaging learner experiences for helping students achieve personal and professional development – and how to help faculty do that well. “Articulation” – taking bone shards in an arch dig and piecing them together. Getting faculty to articulate what learning outcomes for course are. Her focus is on faculty development. Is the strategy (e.g., a threaded discussion) going to support what I want the teacher to get out of this. Online learning (so many professional and personal distractions) can be really challenging to keep relevant. Need to keep it fun (not in an edutainment sort of way). Students needs to see connection to professional development. Empowering students by their education. Instructional design involves creating empowering learning environments for students. Instructional Design as a term can turn people off. Any time you’re contemplating what you want to teach – that’s my definition of ID. Providing innovative – opportunities for ways to learn – in good practice…design something that is rewarding, empowering fun – and that the instructor enjoys. 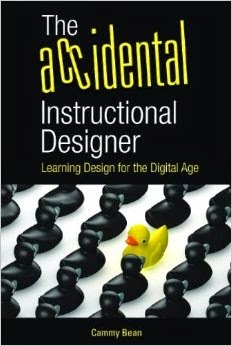 Always intrigued by the broad swath of tasks that are covered by the term Instructional Design. With our diverse understandings of ID, our plan is to interview people who work in the field. Next week: Mary Engstrom to be interviewed. Friday, January 15 at 12:00 pm eastern. Yay! Looking forward to the future conversations!